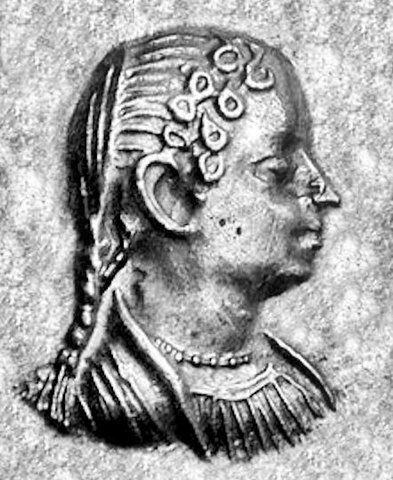 Agathokleia was an Indo-Greek queen who ruled in parts of northern India in the 2nd-century BC. The traditional view is that Agathokleia was the widow of Menander I. In the civil wars after Menander's death, the Indo-Greek empire was divided, with Agathokleia and her young son Strato maintaining themselves in the eastern territories of Gandhara and Punjab. The modern view suggests that Agathokleia was a later queen, perhaps ruling from 110 BC–100 BC or slightly later. In this case, Agathokleia was likely the widow of another king, possibly Nicias or Theophilus. In either case, Agathokleia was among the first women to rule a Hellenistic Kingdom, in the period following the reign of Alexander the Great. The coins of Agathokleia and Strato were all bilingual, and Agathokleia's name appears more often in the Greek legend than in the Indian. Most of Agathokleia's coins were struck jointly with her son Strato, though on their first issues, he is not featured on the portrait.